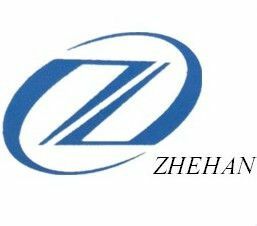 Anping Zhehan Filter Equipment CO.,LTD. 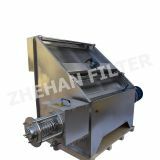 The solid liquid separator widely used in reduce water from the materials. Such as animal manure, food residue, sludge, biogas residue liquid ect. As a chicken, cow, horse and all kinds of intensive farms for animal feces, distillers, dregs, starch dregs, sauce dregs, slaughtering plant and other high concentration of organic sewage separation. This machine solve the problems that manure pollutes the environment. And also can produce high economic benefit. This series of solid-liquid separator has been developed by our company after repeating trials, tests and continuous improvement. 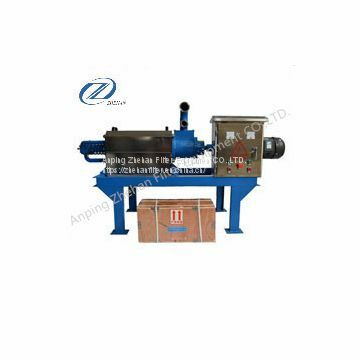 The machine is mainly composed of screw extruder and submerged non-blocking pump. The machine has the characteristics of reasonable design structure, reliable performance, simple operation, good separation effect and convenient maintenance, etc. We Also Could supply the Dewatering screens,It can be customized different size . As the Screen will be damange after using and need to update. Notice: this product requires the material to be fluidity. It is not allowed to be like rope, plastic bag, iron sheet and board. Before the equipment is used, it must be filled with 2kg gear oil in the gearbox. The solid dung will out from this part. Backscrolling Johnson screen, this is our company's product, made by stainless steel. Mechanical power plant,Applicable voltage is 110/220/380V. 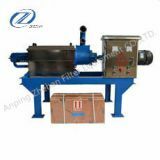 Spiral conveyer was made of Stainless Steel material ,high temperature and pressure resistance. Warm tips: Please turn on the power of the host before starting the machine, then turn on the power of the sewage pump. To prevent accidental damage to the host, turn off the power of the sewage pump before shutting down the machine. Widely used in reduce water from the materials. Such as animal manure, food residue, sludge, biogas residue liquid ect. To Anping Zhehan Filter Equipment CO.,LTD. 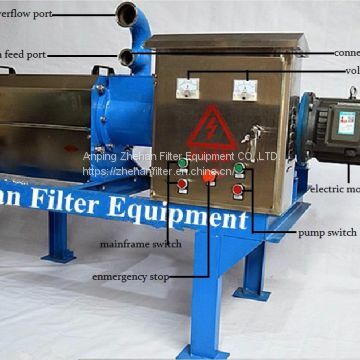 INQUIRY ABOUT Animal manure separator for chicken/solid liquid separatorAnping Zhehan Filter Equipment CO.,LTD.